On this scenic drive around Banff you will be visiting many of the attractions in and around this beautiful and cozy mountain town. This tour is a half-day tour (with the option of making it a full-day tour)and provides you with time to take a few pictures and capture the sights and sounds forever in your memory. The drive begins at the west entrance of the townsite. Take Mount Norquay Road north towards the Trans Canada Highway. Just before you reach the Trans Canada Highway (Highway #1) on the west-side (left) is Vermilion Lakes Drive, where you can experience beautiful views of Mount Rundle and Vermilion Lakes. Once on the Trans Canada, go eastbound to the town's east entrance. Exit the highway, then turn left and go north on Lake Minnewanka Drive to Lake Minnewanka, which comes from the Cree: Lake of the Water Spirit. This is a large dammed lake, home to many native legends about the spirit that lived in these cold deep blue waters. There are picnic areas here as well as a concession stand, which sells snacks and/or light meals. Continue on back toward Banff, turn left at the Banff Rocky Mountain Resort and travel up Tunnel Mountain Road. 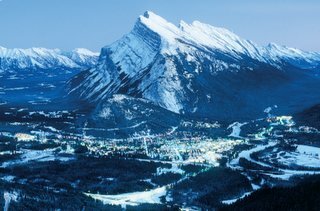 You will soon come upon a viewpoint where you can see the famous Banff Hoodoos. The term Hoodoo is an African word referring to humans who had been turned to stone through witchcraft. At this viewpoint you can admire vertical standing pillars of deposits that have stood the test of time. In case you have time and are interested, you can return to Tunnel Mountain Drive later where there is a trailhead for Tunnel Mountain. With its many switchbacks, this is a nice relaxing hike through a forest of Douglas Fir and Lodgepole Pine. Your reward at the top is an expansive view of the Bow Valley. From the back of the Banff Centre, continue on Tunnel Mountain Drive which at the sharp curve will eventually turn into Buffalo St. It is here at this curve, known as Surprise Corner, that you can see the Fairmont Banff Springs Hotel set in the midst of a green sea of trees. Simply beautiful! You will have a photo that looks like a postcard! From here you may here something... the sound of rushing water! If you look down you will see the white waters of the Bow River flowing into Bow Falls (which incidentally could be your next stop). Please be very aware of the traffic at Surprise Corner,because of the curve - it can be quite surprising and we don't want you visiting the Mineral Springs Hospital on your vacation! You are now heading back to the town of Banff. This is the end of your half-day tour. I hope you have enjoyed your scenic drive - wish I could have gone with you! Have to get used to this virtual aspect! 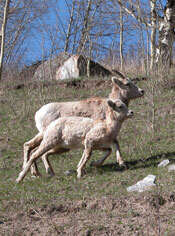 If you would like to spend a few more hours discovering what Banff has to offer, come on, let's go! I've got plenty more ideas! 1. Directly following the bridge, turn right onto Cave Ave which leads you to the historic Cave and Basin. 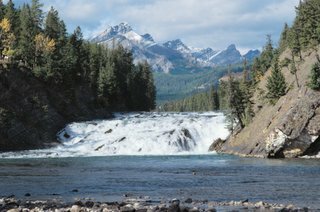 Here you can find out more about the beginnings of Canada's first National Park - Banff National Park. Go back in time to 1883 when the hot springs were discovered by three young rail workers and retrace their steps on the boardwalks provided. You can also meet one of our tiniest attractions - the Banff Hot Springs SNAIL - (no, not to eat.) in the Basin. View historic pictures of the Bathhouse and visitors who came to take advantage of thehealing waters. From here you can walk the boardwalks in many directions, depending on what interests you. Watch how the hot sulphur waters as they percolate out of the ground. This may get you in the mood to experience the healing waters firsthand by ending your tour - and your day - at the Upper Hot Pools. But let's not get ahead of ourselves! Keep walking along the boardwalk until you reach the marshes where a bird viewing station has been set up for your enjoyment. 2. Directly following the bridge, turn left onto Spray Ave and take your next right onto Mountain Ave which leadsto the Upper Hot Springs and the Banff Gondola. 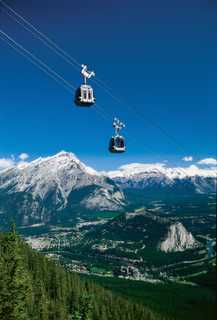 Take the gondola up Sulphur Mountain and enjoy a view like no other! Take a seat in the circular restaurant located up on top of the mountain or walk across to the 1903 stone meteorological observatory on neighbouring Sanson Peak. 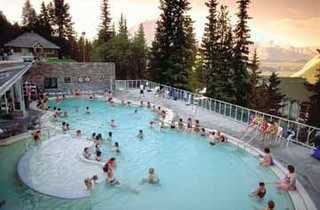 Then take a long hot soak in the hot pools and dream of what tomorrow may bring! 3. Directly following the bridge, turn left onto Spray Ave and follow it up to Bow Falls Drive on your left. (Rundle Ave is on your right.) Turn left onto Bow Falls Drive and take it down to the little parking lot facing the famous falls. Get out and enjoy! Go back up Bow Falls Drive and turn left onto Spray Ave which will take you to one of Canada's National Historic Sites - The Fairmont Banff Springs Hotel. Originally built in 1888, (and continuously rebuilt, remodeled and added onto, this hotel is really worth visiting, even if you aren't going to be a guest. There are walking tours available and if you are interested in fine dining - you have come to the right place. I personally can recommend the Bow Valley Grill. If you are a guest at the Springs and would like to relax, you may want to visit the Springs' Spa - The Willow Stream. 4. Directly following the bridge, turn left and then make two immediate rights. Go around the building and you will find a parking lot and relax in Cascade Gardens. (Since we are in the mountains, the flowers are usually planted in late spring and taken out in early fall.) What a colourful location for that group photo and quiet setting for a picnic! If you are interested in Canadian culture and trivia, you can also pop in to Canada Place, which is located in the large stone building. (And it's even free!!) 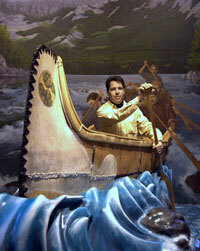 There you can find out more about Canada's National Parks or even Canadian inventions. Listen to a 1940s radio broadcast and shoot your own commercial for Banff National Park! From here you can turn onto Spray Ave and follow it up to Bow Falls Drive on your left. (Rundle Ave is on your right.) Turn left onto Bow Falls Drive and take it down to the little parking lot facing the famous falls. Get out and enjoy! Continue on this road which turns into Golf Course Drive. (This road is closed in the winter and in the summer after dark.) 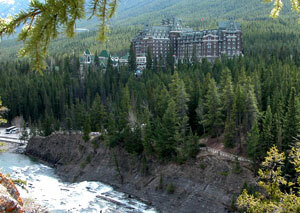 Here you will probably see elk, enjoying the forests and greens of the Fairmont Banff Springs Golf Course! Please stay to the right on this road as it is a two-way loop road which will take you back to where you began. Enjoy thisroad as it truly is a little getaway, away from the hustle-bustle of this mountain town and you have a very good chance of seeing some wildlife from your vehicle. 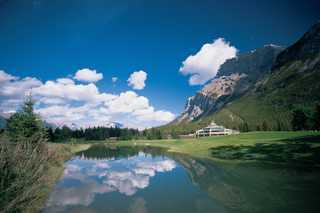 If you get hungry, you can stop in at the Fairmont Banff Springs Clubhouse which is located right in the middle of the 27 hole golf course. This is now the end of my full-day tour around Banff. I hope you've enjoyed all the beautiful sights and sounds of this little mountain town! Enjoy your evening and see you back here tomorrow for our next adventure!